Police spent five hours trying to round up the pigs and get them back onto the truck - as traffic came to a complete halt. 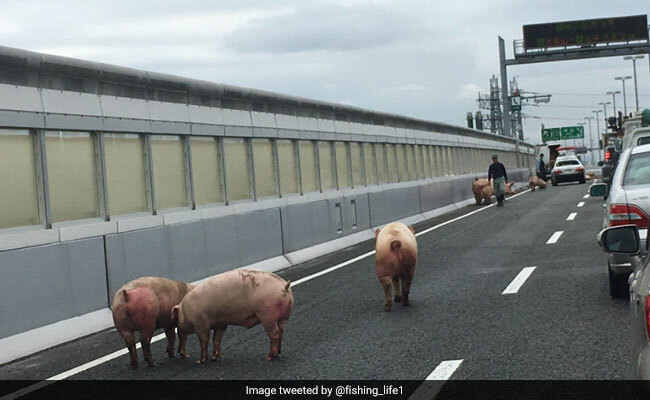 Tokyo, Japan: A group of 19 plucky pigs caused a five-kilometre (three mile) traffic jam on a Japanese motorway after making a bold dash for freedom while on the way to market. Police near Osaka, western Japan, scrambled to round up the porky rebels as they trotted cheerfully along the hard shoulder of the Hanshin Expressway on Thursday after the truck carrying them collided with another vehicle. It was a case of little piggies not going to the market - at least on schedule - as 19 of the 37 creatures on board executed a daring breakout, according to local media. Traffic was halted as the defiant pigs opted for a more scenic route to the slaughter house and frolicked on the side of the highway, oblivious to the commotion they were causing motorists. Local police, who chased the perky swine for five hours, said the farm truck hit another car while the 61-year-old driver was overtaking, resulting in damage to the cage holding the animals. Last year, an ostrich made a similar attempt to live life in the fast lane by breaking out of a cage atop a speeding truck while being transported to a zoo and led Japanese police on a frantic chase along the highway.